Are you tired of substandard offers and bland networks that just ain't choice? Get the real blue stuff. Here at LosPollos.com, the finest offers are brought together with love and care, then slow cooked and optimized to perfection. Yes, the old ways are still best at Los Pollos Hermanos. But don't take our word for it. One test, and you'll know. We are pleased to present you our TOP20 New Year’s countries by eCPM. Switzerland is still ahead in the race. Happy Holidays and all the best for 2017! See you next year! 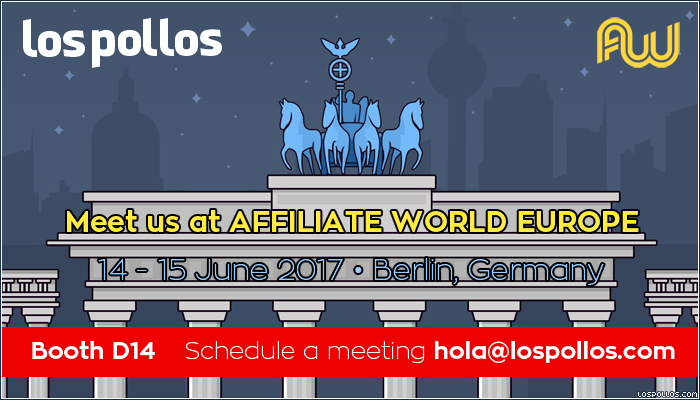 The Los Pollos team is coming to Affiliate World Europe! From June 14th - 15th we will be in Berlin, and we can’t wait to meet and chat with some of our existing and future partners. You can easily book a meeting with Los Pollos by filling out this form, or by sending us an email at hola@lospollos.com. Let us know a convenient time for you to meet, and we’ll see you in Berlin!